The agony of de feet! "The failure of ski jumping" - No wait...Fabio is like 9 hours from now. Dancing is a Sport Party! Fans of the big finish, Bottle Rockets..? Speaking of skiing, you could play a song by Claudine Longet whose relation to sports is that she fatally shot her boyfriend, Olympic skier Vladimir "Spider" Sabich, at his Aspen, Colorado, home on 21 March 1976. No songs about sports however, except maybe the appropriate "Run Wild, Run Free". I agree, at least sports keep most men out of trouble. Is spinning records and CD's a sport? "SSD giving us Jock Itch"
There's a cream for that! I can't wait for the cricket song! morning all! Alright, I don't want any bad sportsmanship today! You are all winners! @Dave B - all the left over puppets from the Thunderbirds? Meghan's favorites! She LOVES "Supermarionation", right Meghan? RRN, I put your request up there for ya! Wasn't boxing a gentleman's sport? Jeez, DB! My eyes have been open for less than 30 minutes and I haven't finished even one cup of coffee and your bombarding with visuals! How long have you been up? Chuck, I got the box of bugs the other day! It came fast! I have it in my fridge now since it was so hot and hadn't had the time to open it yet! Only since 5:30... That's how I roll Chuck! And so I wouldn't crush them, of course! that song was 14 minutes! hell no! ha! ... or label it "Jeff's Lunch"
Good eating like puppies too. How many songs about boxing exist? When will it end? How about a song about Curling? If bleching were a sport I'd be pretty good. I've never realised that most football songs aren't really that serious. I can't decide which one to pick. Wish I'd have listened at the end of last weeks show, I'd have suggested The Referee's Alphabet by Half Man Half Biscuit. - terrace chants. Interesting phenomenon. Do american sports stars ever release cheesy pop songs? it used to be quite fashionable here, where footballers (soccer to you) would release a cheesy pop song, often a terrace anthem at their team's matches. bloody love it. Couldn't happen now though, none of the players have the sense of humor they used to. Duckworth Lewis! this is now my favourite set from any radio show I've ever heard! a listener last week told me about them.... I had no clue! This is why I find listener participation so important! This is probably my favourite selection of music on any radio show ever. If only there was a bit of Hacksaw and their 'Unofficial Punk Rock Anthem For The 2002 Fifa World Cup In Japan And South Korea' although sadly I don't think I could even find a version. OK, this 10CC riff is pretty clever. That's weird. Why does the guy in the old illustration have such tiny forearms and hands? Maybe the soccer songs have come & gone already, but are there any good vuvuzela drones that would make it here? Will the American theme be made in China? So far all these baseball songs are praising the greatness of NY players. A secret subliminal fandom Meghan? The interesting thing is you don't hear a song about Jeter or ARod.... It was the greats.... pre-roids! Good morning everyone! Did you find any songs about kayaking? hahaha.... nope, but I didn't look either! Well, I am sure if you were AMAZING at that game or hobby you would be! Hell, people are getting paid for games/hobbies that I wouldn't think would be possible! AND Ruth liked to party. And what ever happened to Kurtis Blow? In a sweater vest no less! All my rowdy friends are coming over tonight! Hopefully the best is yet to come...morning Meghan! Listening to these songs is the closest to sports participation that I get. I'm exhausted! That picture for KAZIK NA ZYWO is awesome!!! Carlin is the AllTime Champ. This makes "Parents Just Don't Understand" sound like "Straight Outta Compton". 'Super Bowl Shuffle' is a close second to 'Get Mets-merized'. Great sports related music in that era. I know Heat! it's amazing right? Mohammed Ali after knocking out his opponent. It's a photo! Are there any Cross-Fit songs, Meghan? Do you think Magic Johnson's wife has to double bag it to be sure? Station Manager Ken has played some Arnold Schwarzenegger workout music. I miss tagged the hockey monkey song. Well Cameron..... Dave B did.... so he gets the credit! 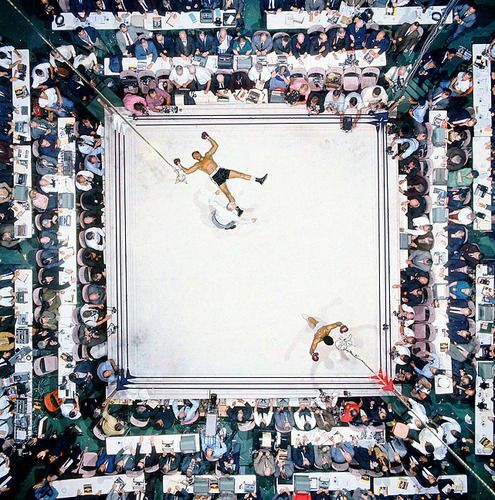 I had to find out where that Ali photo was from...sure enough, from Sports Illustrated: "Aerial view of Muhammad Ali standing victorious after a third round knockout of Cleveland Williams their 1966 during fight at The Astrodome. (Neil Leifer/SI)"
it is, but I didn't find any.... I liked the pic! And a hurling song! Most people this side of the pond think that's a Wayne's World reference. No "Hockey Rink" by the Beastie Boys? Best sports slogan ever (and i heard it over there): Up Down! I'm sure a polo song will appear in the next 16 minutes! i thought you said they were playing awfully. Oh dear. Songs about AFL are terrible. "Fireworks" - Siouxsie and the Banshees!